LGBT • Exhibition pays tribute to the people and groups that spoke up in the name of equality. Al Hartmann | The Salt Lake Tribune David Nelson stands next to LGBT posters he donated to the political archives at the University of Utah's Marriott Library. Al Hartmann | The Salt Lake Tribune David Nelson stands next to LGBT posters he donated to the political archives at the University of Utah's Marriott Library. David Nelson has been a pioneer throughout the gay-rights movement in Utah. Born in Salt Lake City into the politically active Cannon family, he ran the first campaign as an openly gay candidate for the Salt Lake City Council in 1985, but lost. The next year he helped create the Gay and Lesbian Community Council of Utah, which created Utah Pride Inc. in 1989 to produce annual Pride festival events, where the Utah Pride Festival set for this weekend had its foundation. "People who see a need are just going to do it," Nelson said. Over the years, he&apos;s collected memorabilia from those first days of the movement, which he has donated to his alma mater. 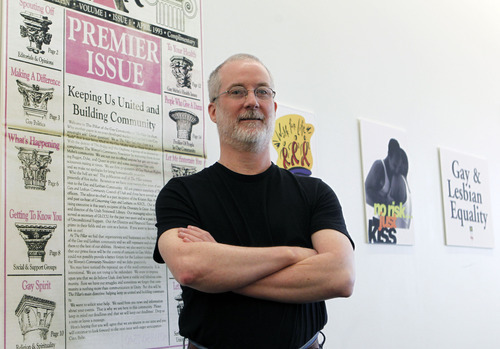 Nelson&apos;s posters, photos and letters, along with other material, are part of an exhibit inside the Marriott Library at the University of Utah called, "Putting Together the Pieces and Connecting Our Community: A LGBT Timeline for Utah and the Nation." It runs through July 11. Psychology major Jace Fowles, with a grant from the B.W. Bastian Foundation, pulled materials such as posters, photographs and papers  donated by organizations such as the Utah Stonewall Association, Utah Pride and the Royal Court of the Golden Spike Empire  from the library&apos;s Special Collections. 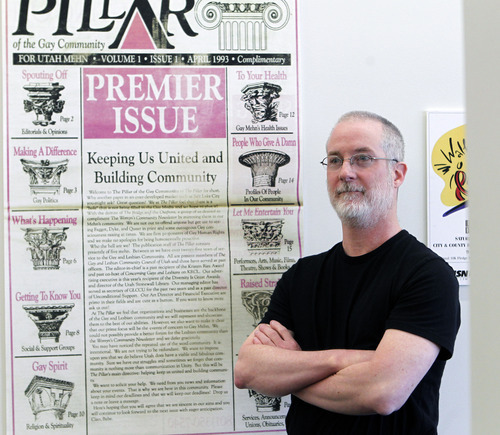 There are several issues of the The Pillar (1993-2007), the longest running lesbian, gay, bisexual and transgender (LGBT) publication in Salt Lake City, as well as ephemera such as buttons and mugs. Nelson said it&apos;s an appropriate place to commemorate the movement, at the institution where he studied political science and that launched his professional career in marketing and public relations. "Every [Utah LGBT] group can trace its genealogy back to the U. of U.," said Nelson, who retired in 2001 and now lives in Millcreek. He created several political groups, including the Gay and Lesbian Utah Democrats in 1990 to affiliate with the Utah Democratic Party  the first such group in the state. He founded Stonewall Shooting Sports of Utah in 2002, which became one of the largest LGBT firearm groups in the country. But his gun-rights beliefs clashed with Pride officials in 2007, when he said he was removed from the festival by police after workers complained about his gun. He filed a complaint against the Salt Lake City Police Department and received "a verbal apology from department Chief Chris Burbank," he said. "I haven&apos;t been to a Pride since then," Nelson said. "But here we are almost 30 years later looking at things we never dreamed of at the time." Those with LGBT memorabilia can donate it to the Marriott Library by calling 801-581-8836.